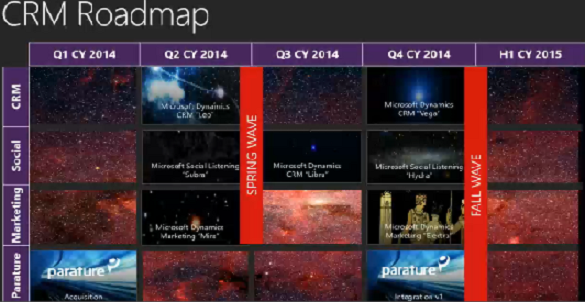 Microsoft Dynamics CRM 2013 – What’s coming next? We have blogged about them all during previous months, however we now have more information and they are now being made available through to the Microsoft CRM Online platform. The Spring wave of CRM brings all these products together really focusing on customer experience. Bob Stutz Corporate Vice President, Microsoft Dynamics CRM has said, “We have built a CRM system people want to use.” And this is proved with a whopping result of 93%, fast release adoption of Microsoft CRM 2013. (3) Microsoft CRM really is made for helping people to do their job better; a software that people love to use. So let’s talk about the new product capability that the 3 acquisitions have brought to Microsoft CRM and how the Microsoft CRM roadmap looks. NetBreeze has enabled social listening with Inside View. Parature brings complex case management. 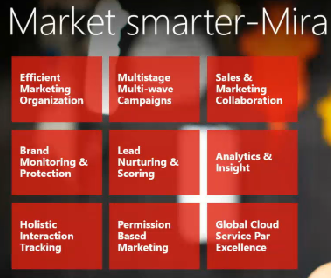 And Marketing Pilot is the first collaborate marketing product for Microsoft CRM. It’s a fact that your customer facing people who understand their customers the best, are the most successful. Social insights will enable those customer facing people to create more engaging conversations, making your business more competitive. Social listening empowers news, financial information, basic information and of course social networking data. You will know who you are dealing with and understand that person and their company. You will know why they want to hear from you – be relevant. Deeper conversations and targeting. You can find out how you can get connected to that company using 2nd or 3rd degree connections on sites like LinkedIn. Social listening uses over 30,000 different sources of data! This really does enable big data / little data strategies. Using web self-service facilities really help to drive resolution and get answers quickly. Parature also facilitates online chat as well as channels such as email, phone, chat as well as tracking face to face conversations, or telephone calls. This unified service desk (Parature and CRM integration) will be included in a new Microsoft CRM Online Enterprise license (more on that later in this blog). 2 out of 3 marketing managers feel pressure from the board to prove marketing value. Most marketers don’t know which of their campaigns are making an impact. Which campaigns are working the best that can be repeated? Using Microsoft Dynamics Marketing enables marketers to seamlessly manage campaigns, using more marketing automation and reducing the need for disparate systems. You can use the product to generate announcements and newsletters and generate click throughs. Marketers can track through website visits and track metrics against each prospect. Each lead is scored using lead behaviour metrics and this really helps the collaboration between sales and marketing. Sales know what the hottest leads are and can focus on those. 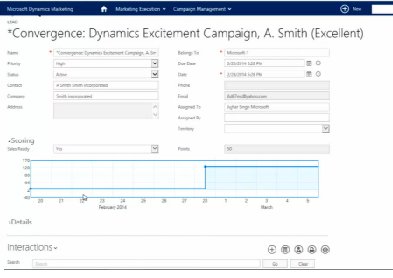 Microsoft Dynamics Marketing will also help with branding, monitoring the buzz of campaigns, how positive corresponding tweets are, and more! So during 2014 there are 8 update releases planned for Microsoft CRM 2013. This will be Microsoft CRM Online and On premise, and will capture incoming social feeds from any source. These can then be directly converted to leads, opportunities or cases. There are multiple social profiles for a contact. Leo also includes some mobility and platform enhancements. Mira is enabling Marketing Pilot / Microsoft Dynamics Marketing. It will be available in 35 markets and 10 languages. You can see marketing budgets and how well marketing campaigns are performing. Marketers can track how many leads generated and delivered and monitor marketing efforts. The lead can be scored and rescored and it will capture the digital footprint which is passed back to CRM to make the data actionable and trackable. 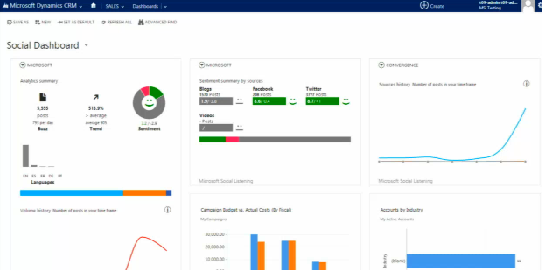 The Subra release is Microsoft Social Listening. If you want to see the level of social engagement by account that level of detail will be available. Vega will improve the offline experience, as well as improving the process capabilities of Microsoft CRM with invoking actions. Electra sees the release of SMS, mobile, social and landing pages. Social engagements taking them to the next level. Microsoft CRM Online Spring Release brings with it another license type – Enterprise. The Enterprise CRM Online license includes a unified service desk, cases, leads, opportunities as response to posts, data segmentation, behavioural tracking, digital asset management and brand management. The Professional CRM Online licenses now include social listening and social analytics. All products can be purchased standalone or bundled with Microsoft CRM. This entry was posted in Microsoft Dynamics CRM Features and News and tagged Dynamics CRM 2013 License Prices, Microsoft CRM Online License, Microsoft CRM Online prices, Microsoft Dynamics CRM 2013, Microsoft Dynamics CRM 2013 Roadmap by Catherine. Bookmark the permalink.